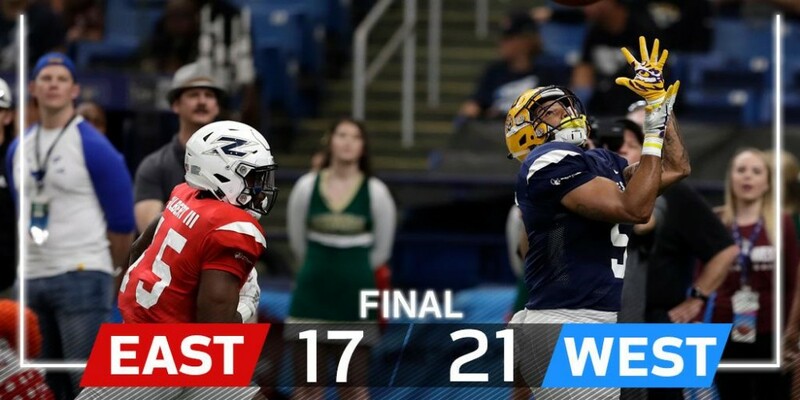 The East-West Shrine Game was my very first time experiencing a game live, so thanks to the good people at NGSC Sports for giving me an opportunity. The game started with the East deferring to West. The West started their opening drive with a name we recognize, Rypien, but it wasn’t Mark Rypien of the Washington Redskins. It was his son Brett of Boise State with the ball under center and he quickly he made two big completions to Ron Quavion Tarver of Utah State. Two completions, one of 20 yards and another of 18 yards. But that wasn’t the end of the opening drive for the West. They got a couple big runs from Nick Brosette of Louisiana State and he finished with a five-yard touchdown on the opening drive for the West. Then, it was the East turn to show the fan’s at Tropicana Field in St Petersburg, Florida what they can do on the opening drive lead by David Blough of Purdue. The series started with Blough connecting with Maryland running back Ty Johnson for a 10-yard gain and they added a couple of runs for Johnson, but the drive fizzled out and the East had to punt back to the Western squad. A quarterback change was made when Easton Stick of North Dakota State came in and connected with Tarver for a couple of short gains that led to a three and out. The crowd started getting restless and they were still sitting around waiting for the East to get their gears going in motion but to no avail. An interception of Jordan Ta’amu to safety Tyree Kinnel of Michigan on a pass intended for Georgia receiver Terry Goodwin. It was the second that led to a touchdown by running back Devine Ozigho of Nebraska. The dominance of the West was seen early on defense with sacks from Markus Jones of Angelo State and Justin Hollins of Oregon. The second half started with the East fumbling the snap by quarterback Cornelius Taylor of Oklahoma State. Easton Stick started the series for the West which led to a three and out. But you could feel the West trying to take over the momentum of the game led by an Interception by Mcneese State’s BJ Blount that led to a touchdown with North Dakota State connecting with Shawn Poindexter receiver from Arizona State which put the West up comfortably 21-0. So the East was down, but the players and sideline were pumped up and you could see they were anxious to get something going but it led to another Int by South Florida’s Mazzi Wilkinson. This turnover led to another West three downs and a punt. The East was led down the field by quarterback Blough who connected with Princeton tight end Jasper Horsted for a sizable gain to get the East rolling. It would lead to a touchdown to Georgia receiver Terry Goodwin II with about two minutes and fifty-two seconds remaining in the third quarter and left the East trailing by fourteen. Blough and the offense had the defense pumped and the crowd excited after another three and out by the West. He was the quarterback with the hot hand for the East and gave them life after hitting tight end Daniel Helm of Duke with two big receptions that led to another touchdown to Goodwin II to cut the lead to seven with five seconds remaining in the third quarter. The fourth quarter started with the West taking their opening possession and Rypien connected with Arizona receiver Shawn Poindexter on a 25-yard reception. He also connected with Utah State’s receiver Ron’Quavion for an eleven-yard reception and it seemed as though the whole game Rypien had a connection with Tarver and Poindexter when they were on the field together. But the drive ended with a fumble, so the East was back on the field after the West turnover led by Mississippi quarterback Jordan Ta’amu with a couple of positive pass plays to Goodwin II for eighteen yards and another reception of twelve yards to Syracuse’s Jamal Custis which led to a thirty-seven yard field goal by Utah Kicker Matthew Gay to cut the West’s lead to four. Now the West led 21-17. So as they tried to hold on to the lead and win the game, the West started their drive with a couple of runs with Pittsburgh’s Darrin Hall Jr. They were able to ice the game with the West winning by the score of 21-17. In closing, I really want to thank the Shriners and NGSC Sports for giving me an opportunity to experience a game like this up close and personal with a few new friends I met along the way. So I say thank you, Shriners and Ralph Garcia, for a great opportunity. Brett Rypien is not Mark Rypien’s son. He is Mark Rypien’s nephew.